The Cash Benefit model presents advantages for both the insurer and for the insured. Flexibility. The most obvious advantage for the insured is the flexibility in how funds can be used. 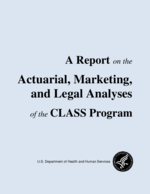 This allows the insured to use the cash payment for nontraditional providers of care, informal caregivers, non-licensed providers, home modifications, help with instrumental activities of daily living (IADLs) like meal preparation, housekeeping, transportation and other services that are either not covered or are covered on a more limited basis under a traditional reimbursement product. Another advantage for the insured is the flexibility to “save up” the daily cash benefit payments and use them only on days when paid care is needed. For many people, paid care needs are “lumpy” in the sense that one might need full-time care during the weekday but no care at night or on weekends when family care is available. A fixed daily benefit reimbursement amount does not accommodate that type of expenditure pattern but a cash benefit which can be “banked” until needed can better match the uneven pattern of care needs. A cash benefit also can provide value to family members who may incur costs associated with caregiving. For example, a daughter who needs to hire child care or quit her job in order to provide personal care for her mother can use the cash benefit to offset those costs. Product “Shelf Life.” Another advantage to insureds is that cash benefits have more flexibility to remain useful and contemporary as new types of services and providers evolve. For someone buying a policy today which they likely won’t use for 20 to 30 years, this flexibility can be important. If the policy benefits and covered services are defined based on what is known about today’s service environment, without flexibility to upgrade, the policy can more quickly become obsolete. Compliance. A cash-based product is easier for the insurer to develop, file and maintain policy language since there is no need for provider or service definitions. Additionally, this means fewer state variations which also expedites the state regulatory approval process. A cash benefit also has a longer “shelf life” which benefits the insurer as they do not need to design and file product updates as often in order to keep pace with a changing service system. Administration. A cash benefit policy can be easier to administer in the sense that the insurer does not need to verify provider or service eligibility -- only that a qualifying disability and the need for long term care exists and that other policy provisions are met. One carrier mentioned that benefit payments are facilitated with a cash policy because they are typically transmitted via electronic funds transfer.